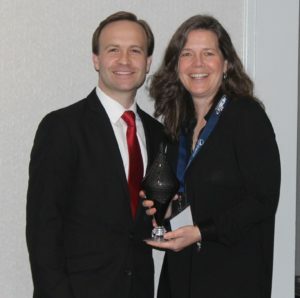 Congratulations to the International Dark Sky Park at the Headlands (Michigan, U.S.), which won the distinguished recognition of the state’s Pure Michigan campaign at the annual Pure Michigan Governor’s Conference on Tourism March 21, when they won the Pure Award for 2017. The Pure Award recognizes best practices in stewarding and preserving Michigan’s natural, cultural, and heritage-based resources. The award was presented to Headlands by Christian Overland, Executive Vice President of The Henry Ford, during the three-day Pure Michigan Conference on Tourism, held this year at the Detroit Renaissance Marriott Hotel March 19 to 21, 2017. “We are delighted that The Headlands International Dark Sky Park is this year’s 2017 Pure Award recipient and we hope this recognition helps promote the terrific stewardship and tourism experiences Headlands provides in the Great State of Michigan,” said Overland, who also serves as Chair of the Michigan Travel Commission. 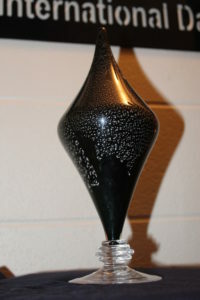 The award itself was custom-designed for Headlands by the artisan glassblowers at The Henry Ford and is a stylized version of the Headlands logo, incorporating silver leaf embellishment over a “dark sky” in one seamless piece of glass that is meant to represent the North Star and the Milky Way Galaxy. “This award affirms the essential public service provided by the Parks and Recreation Department of Emmet County, and is really a celebration of the entire county parks system. It takes our whole team to achieve such an award, and we’re really grateful to the industry experts on the Michigan travel and tourism committee for this recognition,” said Emmet County Parks and Recreation Director Laurie Gaetano. The Headlands is a 600-acre park on the Straits of Mackinac, two miles west of downtown Mackinaw City, at 15675 Headlands Road. The park is free and open to the public every day. While no camping is allowed, visitors are welcome to stay overnight to observe the dark sky overhead. The Headlands became the 6th International Dark Sky Park in the U.S. and the 9th in the world in May 2011, as designated by the International Dark-Sky Association, and each month free programs are held for the public.